It is last act, last scene and the curtain fallin’ down on the 2005 MotoGP season. This weekend marks the final race of the year and it takes place in the fireworks capital of Spain. Its the Comunitat Valenciana Moto GP at the now traditional season finale at the historic Ricardo Tormo Circuit of Comunitat Valenciana. Expect the racing to be explosive as every rider tries to close out the season with a strong result. This is particularly true for Nicky Hayden and Marco Melandri who are both still trying to settle the issue of who will be runner up in the championship this year. The Italian holds an 8 point advantage but the door is still narrowly open for the Yank to pull this one out of the bag. Additionally, Gibernau and Rossi still have some things to resolve, particularly with Gibernau leaving Honda for Ducati next year. Given that the season started with the last lap, last turn bang-up at Jerez I wouldn’t be surprised to see the year book-ended with some more sparks flying between the two riders in Valencia. Rumor also has it that Biaggi may not be with Honda next year after he voiced strong questions about the quality bike he is getting. (This is particularly ironic since Honda dragged their feet earlier about offering Vermeulen a MotoGP ride under the assumption Biaggi and Checa would be riding for Sito Pons next year). This may have once again breathed life into the twitching corpse that has been Barros’ MotoGP career over the past three seasons…the guy is like a mummy always coming back from the brink. Likewise, Colin Edwards really needs to show Yamaha he deserves to be Rossi’s teammate next year so he better find that elusive “fast” gear on the M1. Nakano, Elias, Tamada are all locked up for next year and will probably resume their regular battle at the back half of the top ten. Nakano is held back by the bike but what about the other two? Other riders hoping to impress this weekend are Kawasaki’s Alex Hoffman who is back after breaking his ankle at Motegi. He is without a ride in 2006 and will want to convince team bosses that he is worth a look. 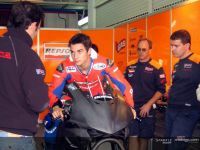 Checa seems to have locked up a Honda ride so he may return to his lackluster results until silly season of ‘06 cranks up. Capirossi is back from his Phillip Island injury but will probably be struggling with his health this weekend. Since he has a Duc contract signed and delivered for next season he can be forgiven if he turns in an usually bad performance. Hopkins is also signed for ‘06 but with riding the Suzuki he will always have lackluster results even if he turns in extraordinary displays of riding. Yamaha hasn’t announced its’ plans for the satellite team next year so Xaus needs to show a flash of brilliance in front of the home crowd. Rolfo should be a shoe-in for D’Antin’s rumored two rider Ducati squad next seasaon but can’t afford to slack off less Ducati’s favored son Xaus steal his seat. Naturally the WCM guys are always hoping for a faster ride and Ellison may actually deserve one. If Dorna is still pressuring the MotoGP squads to hire an English rider then Ellison, along with ex-KTM rider Byrne, may actually be a hot commodity for ‘06. The racing circuit offers its own challenges. In some respects it is a mini-Motegi as it is primarily defined by a stop-and-start flow. The track is relatively short at 2.49 miles in length and is very tight since it crams 14 turns into that small space. The track is reasonably wide and has a very abrasive surface so stable, hard braking may be the trait most needed by the bikes with strong acceleration a close second. This is especially true in the first and final corners. Turn 1 is a 90 degree left taken in the mid-80 mph range but with eye-popping breaking after the riders have hit 180+ on the preceeding straight. Expect lots of late braking here which means bikes the bikes will be set up with super stiff front forks. The final turn is equally tricky since it is a relatively slow, off-camber hairpin left taken after flying through a sweeping left hand kink at 125+. Expect some riders to wash out the front end here and take a tour of the Valencia gravel traps on the outside of the turn. The final turn worth mentioning is the “where men are men” left hand kink at turn seven taken over a buck fifty. Lets see, fast left hand bends in turns 3, 7 and 13…who is it that likes fast left hand turns? Oh yeah, Nicky Hayden. Nicky has been fast in the past at the Spanish circuit but always seems to find the limit of front tire adhesion the bad way. 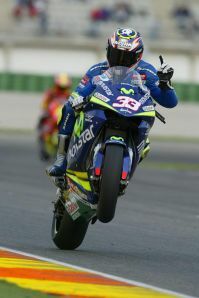 Lets hope he can keep it on two wheels this time. Alright, lots of hard braking. Lots of hard acceleration. A few fast left hand sweepers. An abrasive track surface. Sounds like tires may again be a factor. The Michelins have traditionally ruled at Valencia but Bridgestone made up some serious ground this season as evidenced by Capirossi and Checa’s podiums over the last five races. Keep a close eye on the tire war, especially because a strong Bridgestone performance could move perennial mid-pack guys like the Suzukis and Kawasakis up into the top five while a strong Michelin showing will increase the excitement of the Hayden-Melandri and Rossi-Gibernau issues. The fuse gets lit this Sunday and should make for a grand finale for the MotoGP series.